You are currently browsing the tag archive for the ‘cultivation’ tag. The historical roots of agriculture are a common topic of this blog–which has featured posts about the ancient domestication of pumpkins, pigs, olives, goats, and turkeys. However not all agricultural goods have such long tangled pedigrees which stretch into prehistory. Today we are celebrating a fruit which was first cultivated in 1816 by an American revolutionary veteran named Henry Hall. The deep ruby-pink berries were originally known as a fenberries because the wild plants grow in acidic marshes and bogs, however something about that name struck early pioneers as unpoetic and they started calling the fruit “craneberries”—which was shortened to cranberry. 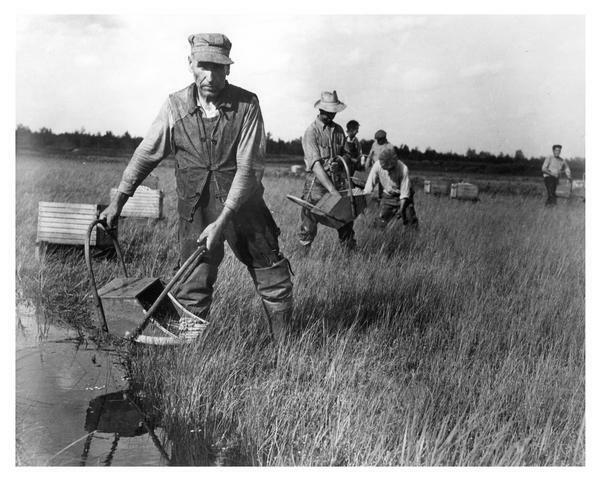 A group of men harvesting cranberries in Wisconsin. Cranberries are low shrubs and vines of the subgenus Oxycoccus (of the genus Vaccinium, which includes other northern berries like bilberries and blueberries). 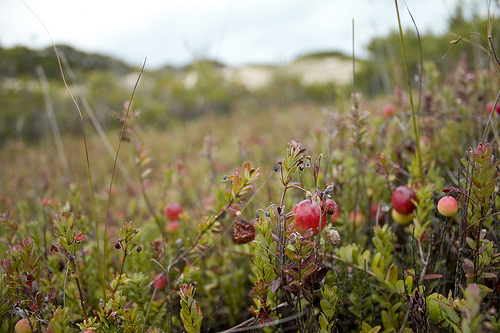 The evergreen cranberries flourish throughout cold bogs around the northern hemisphere. Because cranberries grow in such poor acidic soil (which is also low in nitrogen) they are heavily dependent on the mycorrhizal fungi with which they are symbiotic. Cranberries in a flooded man-made bog awaiting harvesting. The berries become ripe from September through the first part of November. 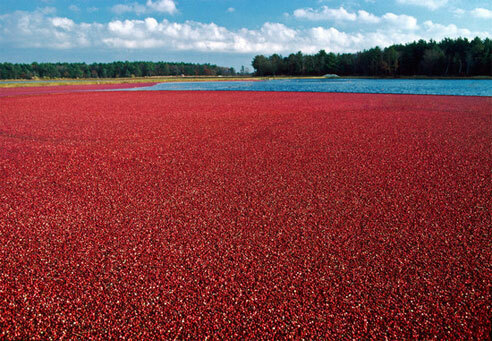 There is a long history of cranberries being hand-harvested by hunter-gatherers as a valuable source of food and dye, however modern methods involve flooding the cranberry bogs and agitating the berries from the vine (at which point they float up and can be corralled en masse). As a food cranberries are extremely tart and contain an imposing mixture of vitamins, dietary minerals, fiber and antioxidants which make them a favorite health food. The cranberry is heavily associated with Thanksgiving and Christmas, when rich cranberry sauses, jellies, and aspics are a big part of end-of-year feasting. They also have an association with the American Navy, which in bygone days used the vitamin C rich fruits to stave off scurvy on long voyages. Just as sailors in the Royal Navy were limeys, American seamen were “cranberries” (there is no word on how offensive this is, so you might not want to run into a bar and start shouting this at drunk sailors). Every year at the banquet table, I am fascinated by how beautiful the color of cranberries is. The berries themselves—and even more so their sauce–produce a sensuous deep crimson pink. Endless decorators and fashion houses have adopted this color for dresses, lipsticks, walls, and what have you, but they were not the first to appreciate the color. 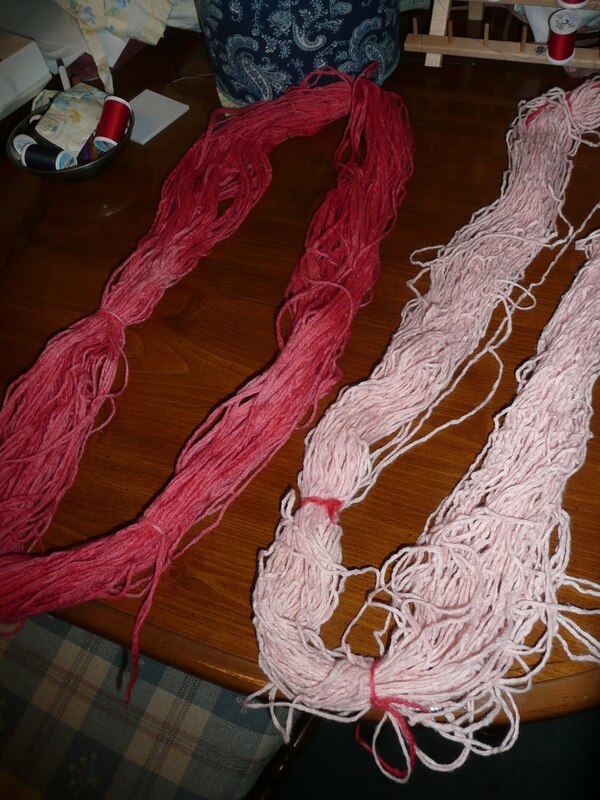 The people of the first nations and later colonial Americans made use of the cranberry directly as a fiber dye. Yarns, threads, and fabrics dyed with cranberries take on a delicate lovely pink color—a direct contradiction to the idea that everything the pilgrims owned was black and white.